I’m fairly sure many have seen the rather weird promo videos for the Sony Ericsson Xperia Play smartphone, you know the ones with amputated thumbs and stuff, then Sony Ericsson moved away from the weird slightly and brought in Kristen Schaal to promote the first PlayStation phone, but even Kristen didn’t get it all right with a first take. 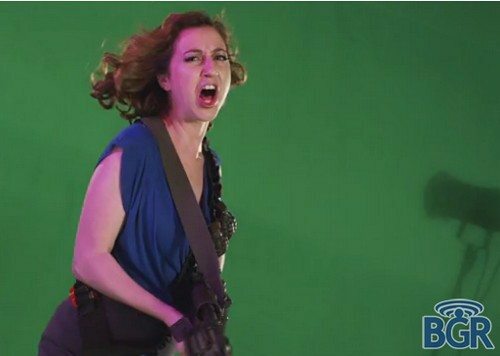 Thus we have for your viewing pleasure below an outtakes, or blooper video of Kristen Schaal in action courtesy of the guys over at the Boy Genius Report, and they say as funny as Schaal was in the promo videos there are undoubtedly more outtakes hidden away. But not this one which delivers two minutes of Kristen Schaal mucking things up as she tries to promote the Android 2.3 Gingerbread packing Xepria Play, simply called Schaal Takes, including the cigar chewing, AK47 wielding Schaal. So I’ll leave it there and let you head on down to hti that play button and check out Kristen Schaal not quite at her best and thanks to the guys for managing to acquire the footage…enjoy.